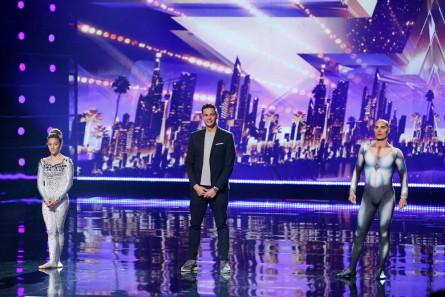 Last week, the acts who made it through to the “America’s Got Talent” finals were Sal Valentinetti, Grace VanderWaal, Jon Dorenbos, Tape Face won the Dunkin Save vote, and Laura Bretan got the Judges’ vote. This week, five more acts made the cut to go to the finale to compete for the grand prizes of $1 million and an opening act in a Las Vegas show. In alphabetical order the acts who got the least amount of America’s votes and had to rely on the Dunkin’ Save vote and Judges Vote were: Sofie Dossi, Steven Brundage, and Viktor Kee. Simon praised “Kadan Bart Rockett” magic act for being “slick” for making 10 people (who were their classmates) appear out of a house. Wild Card act “The Passing Zone” returned to the stage to put Simon through a death defying juggling stunt. He was made to balance spinning plates on top of two pitchforks he held in his hands while also spinning torches on top of his head with the help of some head gear. The stunt was devil themed in honor of Simon who mouthed the words he was “going to kill” the other judges who conspired against him. The act to move on to The Finals was “The Clairvoyants“. Howie said he can’t wait to see what they’ll be doing for their performance next week and has no doubts that they can step it up. 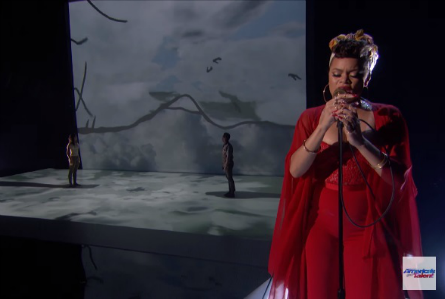 R&B singer Andra Day sang “Rise Up” song with “Blue Journey” performing in the background. 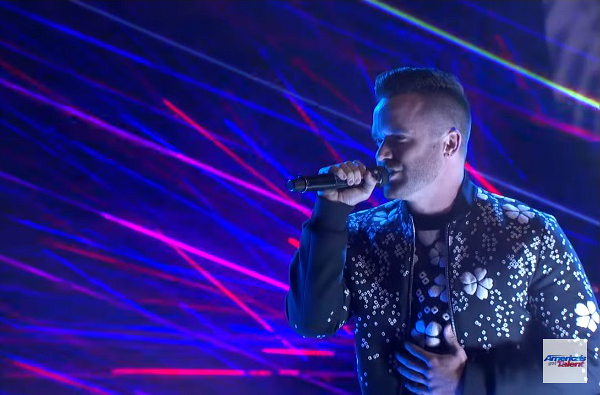 The act that went into the finals was Brian Justin Crum. Simon gave some parting words to the acts going home. Calysta was Simon’s Golden Buzzer. He told them “both of you can walk away from this with your heads held high. You are amazing contestants. 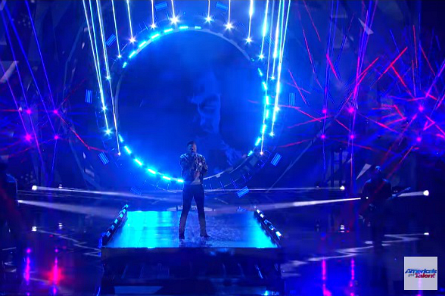 Keep doing what you’re doing and learn from this experience.” Mel B. told Brian he’s incredible and he could win it. Linkin Bridge and Jayna Brown were the next two acts on stage. The night before, Jaya Brown sang “Rise” by Katy Perry. Simon said “it was INCREDIBLE!” Linkin Bridge sang “7 Years” song by Lukas Graham and knocked it out of the park. Mel B. responded “you put Boys II Men” to shame!” Simon said they deserve a place in the finals. The judges played a game of “Revelations” where they each had to vote for which judge did what crazy, unexpected acts as a child. Simon told of his first kiss at age nine in her garden. The judge that stole toilet paper from Nelson Mandela’s house was Mel B. She took a roll of toilet paper as a “souvenir” for a friend. The judge that was expelled from high school was Howie Mandel for dropping a chocolate bar in the school’s pool. Heidi roasted boogers on tooth picks and ate them!! She did not explain the circumstances of the event. Sofie Dossi, Steven Brundage, Viktor Kee awaited their fate. The one spot in the finals chosen by the Dunkin Save vote went to Sofie Dossi! Heidi told her “you’ve been amazing and you’re such an amazing athlete,” and wished her good luck. Next, the judges had to chose between Steven Brundage and Viktor Kee. 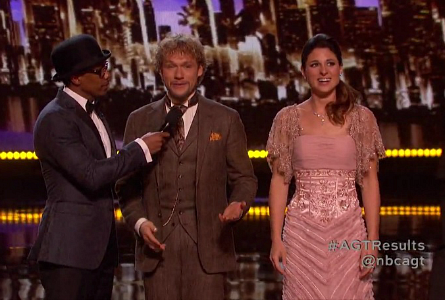 Host Nick Cannon asked the acts for their last words to the judges. Steven said “I’ve never wanted anything more in my life” and asked the judges to help him. Viktor said to the judges “this is my opportunity to realize my real dream and why I’m alive.” He also said that he’d like to inspire others. The judges commented on each act before casting their votes. Heidi didn’t want to chose and “I want both of you in the finale.” The other judges said “you have to.” She chose Viktor. Mel B. said they’re both amazing and are magical and mysterious. She voted for Steven. Simon said this is a very very difficult decision, “I thought both of you have amazing performances last night….I’m going to go with my heart here…the person that should go to the final is Steven.” Howie said “Viktor you’re amazing and original,” and voted for Viktor. The judges vote was tied. The vote fell to America’s vote which was Viktor Kee. 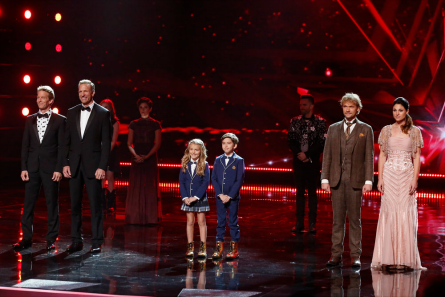 Next Week: These acts will perform in the two night season finale – Linkin Bridge, Sal Valentinetti, Laura Bretan, Brian Justin Crum, The Clairvoyants, Jon Dorenbos, Grace VanderWaal, Sofie Dossi, Tape Face, Viktor Kee. 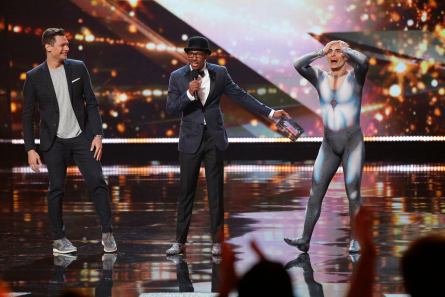 Pictured: AGT season 11 final acts. The two episode finale airs Tuesday and Wednesday at 8/7 central on NBC.